WIYDB? Dispatches from the Front Lines of Motherhood: Mom's Own Health - Fall Calorie Swap Out! Ah, the fall. Colourful leaves, crisp mornings, and all that comfort food. It's delicious, but with shorter days and cold nights, it is not always the healthiest way to eat. Gone are the abundant and inexpensive salads of summer, and we are not preparing to hibernate, so how does a mommy eat well without packing on the tummy? Some clever swaps, that's how. From frothy seasonal drinks, to satisfying soups, and luxurious desserts, there is a healthy way to do it all. Today I have a couple ideas to start you off. More than rain and hockey season, I know it is officially autumn with the arrival of three little letters - P S L. The Pumpkin Spice Latte is something of a modern religion, and such an indulgence for a stroller walk or a nice catch up with a friend. Without an expensive espresso machine and fancy syrup, can you recreate the magic at home? Absolutely yes! There are dozens of internet sites with the so-called secret to a recipe, like this one from famous calorie-reducer Hungry Girl. The problem is, some of them contain so many ingredients, or ones you just never have in the house (French vanilla powdered creamer?) For myself, what makes the PSL so delicious is the rich coffee flavour with that light, spicy taste. I found the following to be just as satisfying, and way easier to whip up. Mix your pumpkin, honey, and spice into your milk, and heat in the microwave 30 seconds. Brew your coffee right on top! Done, that's it. 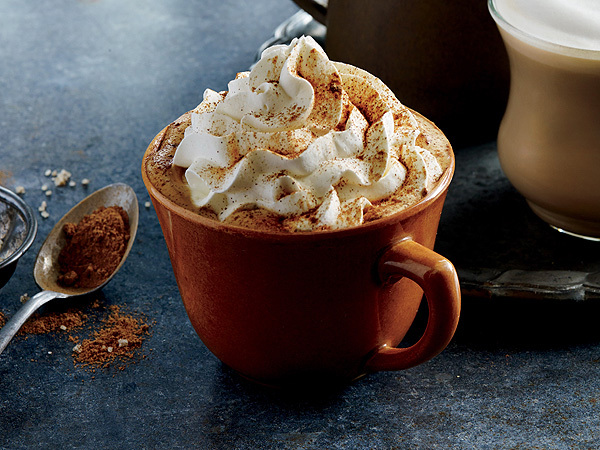 It's not exactly the taste of the PSL, but none of the recipes out there are. Mine is 5 ingredients, 4 of which you probably have on hand right now, and saves you almost 50% of the calories (157 vs 300). A further swap of whole milk and sweetener would cut the calories down to 67 (!!!) but you lose that richness that makes this latte so satisfying. You have to find that balance between "light" and "diet" if you know what I mean. On that topic, evil diets often advocate veggie-packed, broth based soups to help whittle your middle. 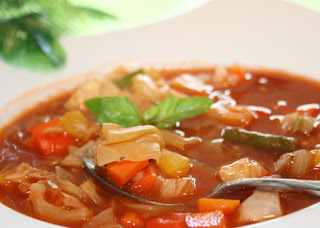 I love soup in all its forms, and a good chicken noodle or a minestrone done right is a real treat. That said, they can be a little lack luster without the pasta, and often feels incomplete without a little sandwich on the side. Boost your soups produce content, and cut down on the sodium by substituting broth with tomatoes! A can of diced tomatoes is a great soup starter, and provides body without bulk. A tomato juice like V8 also gives a nice flavour, with the bonus of a large group of vegetables! Watch the salt though, its surprising. Recipes like this one give you a great idea of how to start with a healthy base, then put a spin on it to suit your own taste! Skip the broth like we suggested, or try using mushroom base! Use different vegetables depending on your likes and the season! Buy what's on sale! Add some beans, lentil, split peas, or barley to give it a little more body! Try some lean proteins like chicken or tofu to make your soup more satisfying! You can eat well without giving up on what you love, but it does take a little planning. I whole heartedly support turning your kitchen in to Chopped every once in a while, but never knowing what is in the house or what to make will lead to frustration... and eating out. Set yourself up for success by stocking some healthy staples in your kitchen like tuna, frozen mix vegetables, and whole grains like quinoa. The stressed out and hungry future you will be grateful! Do you have some healthy fall meals to satisfy our readers?